Argentina is a unique place that sets itself far apart from the rest of South America. Buenos Aires is referred to as the Paris of South America, and some say that passing through Patagonia is like being in the Alps. Here are a few factors that make Argentina unique. Ah yes, mate, an ubiquitous symbol of Argentine culture (Uruguay too). Mate is a bitter, loose-leaf tea that is drunk through a metal straw in a small cup. It has a strong flavor and contains a chemical compound very similar to caffeine. Often consumed as a social activity, each individual finishes the water in the cup, which is also referred to as the ´mate´, and a person in the circle dedicated to the preparation of the mate refills it and passes it to the next person in the circle. There is a special way to prepare it that if done properly will yield a layer of foam on top as can be seen in the photo above. If not done properly, an Argentine will be quick to inform. Most people drink mate in its utterly bitter form as is without adding anything, but some brave to stray away from the cultural norm and add sugar or honey. Expect to see mate everywhere you go: on the bus, in a shopping center or even behind the bar at a restaurant. Mate is to Argentines as cigarettes are to the French. Odds are very high that you will encounter several opportunities to drink a mate. Try it, but don´t expect it to blow your mind. The flavor is quite strong and bitter. It is a more efficient ´upper´ than coffee though. This country revolves around soccer. Some say that a local match in Buenos Aires is one of the most intense sporting energies in the world. These guys live and die for their teams. There are rivalries in the league that span over 100 years with two teams at the forefront, River Plate and Boca Juniors. Traveling through the country you will see fans for Boca and River in all corners. While these two teams are the source of much tension among Argentines, the whole country unites for matches with their national team who boasts some amazing players such as Lionel Messi and Javier Mascherano. Another famous icon for the country is Diego Maradona, a footballer considered by many to the the greatest player who ever lived. After having brought his team all the way in the 86 World Cup with some amazing goals, including the´goal of the century´, he started along a path of drugs that ultimately led to his demise in what could have been an even more proliferous career. Anyone who speaks Spanish will surely admit that Argentina has a very special way of speaking. Lunfardo is a form of Castilian Spanish that started in Buenos Aires and is now the common dialect for all Argetines and Uruguayans. It is similar to the way Italians speak in that it is loud, punctual, and has tonal swings. It has a melodic and elegant aspect to it as well making it very identifiable. If you hear an Argentine speak Spanish, you will know their nationality immediately. Swearing is very commonplace and makes its way in casual conversation. It is not unusual to hear someone say ´la concha de la lora´ as a way of expressing dislike. Go ahead, try and translate that. Hint: concha does not mean shell in this situation. The flow of conversation is very casual and is sparked more frequently between people who do not know each other. Sometimes the cashier at the supermarket will keep talking to the customer in front of them about a futbol game even if there is a long line of people waiting. For more information on Lunfardo, check out a previous blog that explains many commonly used words and phrases. 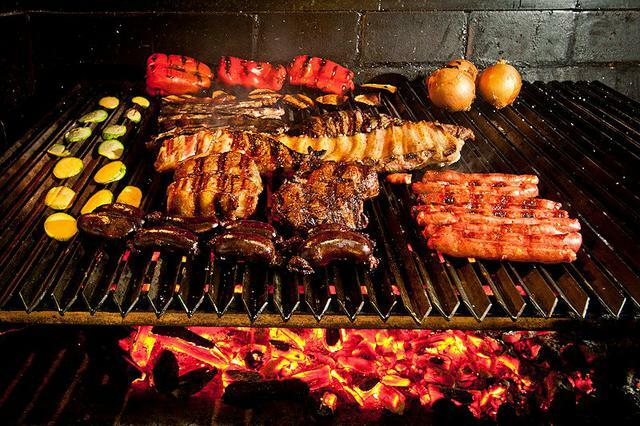 It´s not Argentina without meat..... lots and lots of meat. Grilling is considered an art, and it goes all the way from the meat selection at the butcher to eating it together with friends. Here you do not just go to a supermarket to get a good cut of meat. You go to a ´carnicería´ where the butcher knows anything and everything about what cuts you want, how much you should get, and even will give you advice on how to best prepare each cut. The real action happens at the asado where they start a fire in the corner of the bbq and then place carbon coals over the fire until they are red hot and ready to be spread under a ´parrilla´ (a parrilla is the actual grill where the meat is cooked). A good weekend in Argentina is not complete without an asado accompanied by a fernet. Doing an asado should be the #1 thing on your list for the true Argentine experience. One of the most characterizing aspects of the Argentine culture is the fact that the country is almost always in a near economic crisis on the brink of collapse. The average inflation rate has been 20% for several years, and economic experts are always predicting a market collapse within the next few months. While these collapses have happened before, they do not happen as much as the experts predict. Argentina has been chugging along pretty well considering. Given this turbulent economic state, many might expect to find the people in a state of panic or total chaos, yet the people still continue their lives, knowing that the best thing to do is take advantage of the good times while they are here and hope for the best. As they say in Argentina, ´ya fue´ - It already happened.